When you use Facebook chat to talk with someone, a Seen By confirmation is displayed in the your Facebook chat box once your friend on the opposite end has actually seen or read the message. 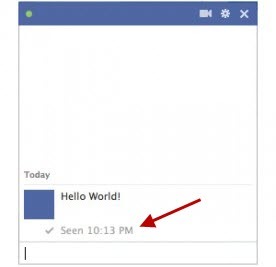 The Facebook seen message also contains the exact time when your friend has seen the message. 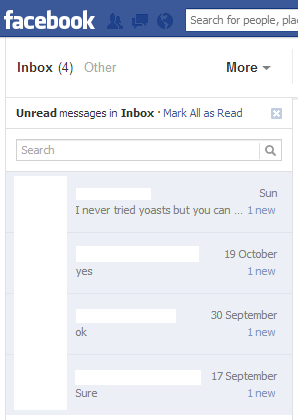 Its a great feature as it confirms if your message on Facebook chat has been delivered. But its also a privacy issue. Sometimes, you may want to not want your friends’ to know that you have seen a Facebook chat message sent by them. But its impossible because as soon as you see the message, a Seen By confirmation will be displayed instantly in your friend’s Facebook chat box. If you want to turn off ‘Seen By’ receipt feature in the Facebook chat, there is no official way to do this. Facebook privacy settings may include an option to turn off the ‘Seen By’ message in Facebook chat but for now you must use third party solution to hide it. Here’s a list of working solutions. If you go to the Facebook’s messages page, you will notice that small messages sent by your friends are fully visible in the preview box. If you read a message just from the preview and DO NOT click on the message, you have not actually ‘seen’ the message, and thus, Facebook will not send the ‘seen by’ confirmation message to your friend. Unfortunately, this is only applicable to short messages. You will not be able to read long messages this way (for example, the first message in the screenshot). Facebook Chat Undetected is a browser extension that hides the Seen by message in all your Facebook chats. To install Facebook Chat Undetected, visit this link and click on ‘Get Chat Undetected’. It will automatically detect the web browser you are using and will prompt you to install the extension if you are using Firefox. You can just confirm to complete the installation. If you are using Google chrome, it will download a setup file on your computer. You then need to run it to install Facebook Chat Undetected on your Chrome browser. Restart your browser after installation. Now Chat Undetected will automatically disable the Facebook chat receipt feature. No one will ever know if you have seen their Facebook chat message. Social Reviver is an advanced browser extensions which is available for Firefox, Opera, Google Chrome and RockMelt. It lets you make many Facebook layout and functioning changes. For instance, you can get old Facebook layout back (pre 2011 layout), disable Facebook timeline, disable chat sidebar etc. And, you guessed it, it also lets you disable the ‘Seen by’ message receipt in Facebook chat messages. You just need to install Social Reviver from here, and enable this option from it settings. Faceboob Chat Privacy is a browser extension that works exactly like the ‘Facebook Chat Undetected’ tool above, except that this extension is only available for the Google chrome browser. You can install it from here. Most of us already have Adblock Plus already installed in the web browser, mainly to disable YouTube ads. Adblock Plus can also be used to disable the ‘Seen by’ Message in Facebook chat. Here’s the procedure. Note that its a good idea to use a meaningful name for the filter so that you remember its purpose in future. I have named it, Disable Facebook Chat Receipt. Click on Add Filter to confirm. Adblock Plus will now turn off the Seen By message receipts in Facebook chat. Important Note: All the methods to disable the Facebook ‘Seen By’ receipt in chat messages uses web browser extensions. So, if you are using a Facebook app on your mobile device or tablet to read the chat messages, your friends will still see the Seen by confirmation. The above tricks are will only work in the web browser where the appropriate extension is installed.